Ramadan is almost coming to an end which means Eid will be here soon. 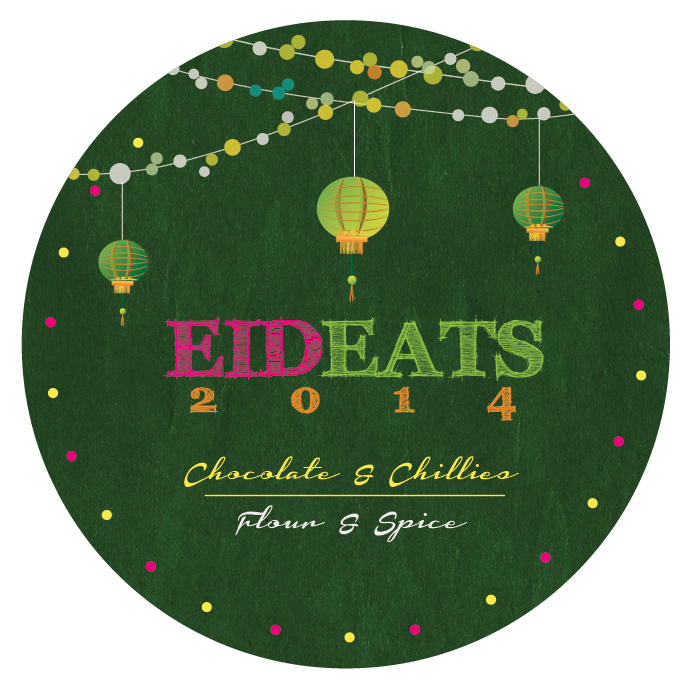 Today is Eid Eats 2014, a virtual Eid Party, that Sarah from Flour & Spice and I are hosting. We asked all of you to make a dish that you would make for Eid. For many, this is a time to make extravagant meals and have family over. Personally, I have never done a lot of cooking on Eid. We used to go to my parents for a big lunch and now we visit my brother and his family. On Eid, I usually make something simple that we can eat after Eid Salaat. 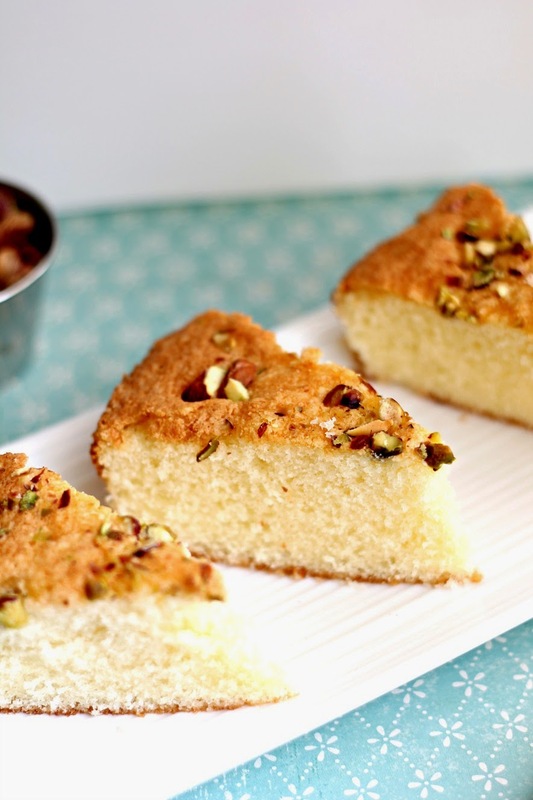 This Pistachio Topped Vanilla Cake is one of the treats I like to make on Eid. It is very simple and easy to make. It also wonderful when used in a trifle. Prepare a dish that you would normally make on Eid. Write up a blog post and post on July 25, 2014. Link your post to Flour & Spice and Chocolate & Chillies. Make sure to add the above button to your post. On July 25th, visit Sarah's or my blog to add your post to the link up in the following layout: Recipe Name, Blog Name. I hope everyone had a blessed Ramadan and may Allah accept all of our fasts and ibaadat. Preheat oven to 350 F. Grease two 9 inch round pan and line with parchment paper. Grease the parchment paper as well. Using an electric mixer fitted with the paddle attachment, beat the eggs and sugar until slightly thickened, approximately 1 minute. Add the remaining ingredients (except the pistachios) and beat for 1 more minute or until the batter is smooth. Be careful not to overbeat. Pour the batter into the prepared pans. Sprinkle the pistachios on top. Bake for 30-40 minutes or until a toothpick inserted in the center comes out clean. Eid Mubarak !!! JazakAllah for inviting me over to Eid Virtual party ,this looks simply delicious would love to try in sha Allah!!! Asiya your cake look delicious :) I wish you a Blessed Eid Mubarak and thank you so much for inviting me to the Eid Party! Boy am I relieved I didn't make a pistachio cake! Looks great, would be lovely with tea! You can't beat a proper vanilla cake and your addition of the pistachios give it another dimension. A simple yet elegant dessert. Love it. Thanks for hosting and an early Eid mubarak to you! Thank you for hosting this lovely party. Looks so mouthwateringly fluffy and moist! Gotta try this recipe! Eid Mubarak to you dear, your cake looks so simple and delicious. Thanks for the awesome party I hope we will have another on for Eid El Adha too. I love pistachios! On anything, or on their own, hehe. This looks so delicious!